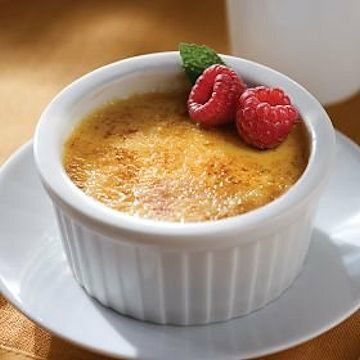 Decadently delicious and exceptionally easy our Creme Brulee is sure to be your favorite dessert! The delightfully creamy custard is already cooked - so you simply take it from your freezer, in its own reusable ceramic ramekin, sprinkle it with the sugar packet provided and broil. Let it sit while the caramelized sugar sets then enjoy. Elegant desserts just aren't supposed to be this easy! But your secret is safe with us. Enjoy the compliments!